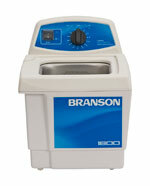 Ultrasonic cleaning is faster, more thorough and safer than most other methods. Scrubbing, soaking and steam don't even come close. It is powerful enough to remove proteins, waxes and heavy oils. It penetrates to deflux circuit boards and SMDs, yet is gentle enough to clean tiny precision assemblies. Ultrasonic sound waves moving through a cleaning solution create an effect called cavitation, the rapid formation and implosion of microscopic bubbles. Heat enhances the process. 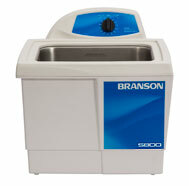 This is the source of ultrasonic effectiveness in cleaning. Very effective to clean specimens, lab tools, microscopy parts, embedded samples, specimen mounts, etc. Leakproof and foolproof. Easier to handle and safer to fill. Sealed tight to prevent leaks. The controls are easily accessible and resistant to spills. The control board is mounted high and vertical, to stay dry. Tank drains with valve on models 3800 and 5800. Helpful at start-up. 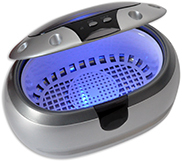 Ultrasonic pulses, activated before cleaning begins, remove unwanted air bubbles from the solution. This gives better results due to higher cleaning efficiency. Control of cycle time and temperature with clear readouts and one-touch setting. Maintains batch-to-batch consistently because the Cleaner resets automatically to the last time and temperature settings. Developed to make specimen handling easier. The most effective cleaning action occurs about one inch (2.5cm) from the tank's bottom. Using a tray gives more beneficial cleaning power. [BEAKERS] for Polypropylene, Pyrex®, and Stainless Steel Beakers for the Ultrasonic Cleaners. Small, cost-efficient ultra sonic cleaner for samples and parts. Comes with removable, oval shape ABS plastic parts holder. Hinged cover lid. Electronic pushbutton timer with 3 minute auto shutoff. Separate off button. LED illuminated bath. 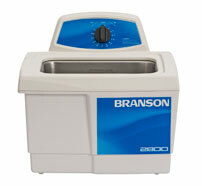 Stainless Steel Cleaning Basket to hold small sample or parts for cleaning in solutions, steam or ultrasonic cleaner. Basket diameter is 38mm (1-1/2"). Spring loaded grip keeps the basket conveniently closed. Basket opens when grip is pressed. Practical working shape for many items such as eyeglasses and other smaller applications. Comes with small parts holder. Approximately 50 watts. Useable dimensions within working basket: 15.9 x 8.3 x 42cm (6-1/4 x 3-1/4 x 1.65") (L x W x D). Hint: If you run the cleaner for 1-2 minutes and allow degassing of the cleaning solution before inserting parts, quicker and more effective cleaning will occur. Warm water increases efficiency. All PELCO Kleensonic ultrasonic cleaning solutions are formulated for high performance cleaning, are environmentally friendly, concentrated to reduce shipping costs and do not require hazardous shipping. PELCO Kleensonic WRS is an environmentally friendly cleaning compound in powder form formulated for removing mounting waxes used in specimen preparation, semiconductor processing and casting. Needs to be dissolved in water to make the cleaning solution. Primarily designed to dissolve and remove waxes and oils, but Kleensonic WRS can also be used to remove silicones, finishing compounds, soils and greases. PELCO Kleensonic WRS is compatible with parts or products made from silicon, glass, iron, aluminum zinc, copper, brass and magnesium. 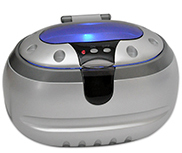 Highly recommended to use ultrasonic agitation to enhance cleaning process and to reduce cleaning time. Sold in container of 1 lb. (makes 2.67 gallons). Usage: 6 oz. (170grams) of powder concentrate in water makes 1 gallon (3.8ltr) of ultrasonic wax stripper solution, best working temperature 50 - 70°C. Usage: (32:1) 4 fluid oz. of concentrate in 1 gallon (3.8 ltr) of water. Can be used at room temperature or elevated temperatures. The cleaning solution is readily rinsed off with demineralized water. 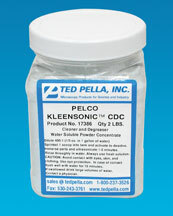 PELCO Kleensonic CDC is a high performance, heavy-duty ultrasonic yet environmentally friendly cleaning powder. Fast acting, long lasting and saves costs, space and time. It is easy to handle, completely biodegradable, odorless, ammonia-free and non-flammable. PELCO Kleensonic CDC cleans and degreases and can be used for removing oils, greases, fingerprints, dust, packaging particulates, soils and buffing and polishing compounds. It is safe to use on all types of metals, including aluminum and magnesium (if rinsed promptly), glass, ceramics, plastic and rubber components. Application examples are cleaning of mechanical parts, electronic components and specimens after grinding, lapping or polishing. Sold in container of 2 lbs (makes 75 gallons). Usage: (400:1) 1/3 oz. of powder concentrate in 1 gallon (3.8 ltr) of water. Scoop is provided in container. Best results with warm or hot water. Immerse parts and ultrasonicate for 1-5 minutes. Rinse thoroughly in water after cleaning. Biodegradable, phosphate and caustic free alkaline cleaner formulated for heavy duty industrial use. Removes oils, greases and a wide variety of soils from aluminum and aluminum alloys as well as copper, brass, and steel substrates. Effective in removing stamping and cutting lubricants, and light polishing media. MC-1 displaces soils and floats them to the surface for easy removal with a skimmer. Use 3 to 10% concentration by volume, 7% optimum (1 quart makes 3.5 gallons @ 7%). Biodegradable, phosphate and caustic-free alkaline cleaner formulated for general purpose and normal maintenance cleaning applications. Removes oils, greases and a wide variety of soils from ferrous metals, steel alloys, titanium alloys, copper and copper alloys, and stainless steel. 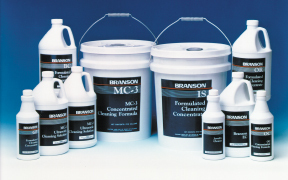 MC-3 is a very effective specially formulated cleaner for aluminum and aluminum alloys. It is especially effective in removing fabricating, cutting and polishing oils. It acts as an emulsifying cleaner; oils, soils and greases are entrapped in the cleaning solution and suspended to prevent redeposition on the clean parts. Use 7-10% concentration by volume and can be used at temperatures ranging from ambient to 160 F (70 C). 1 quart makes 3.5 gallons @ 7%. Biodegradable, phosphate-free alkaline cleaner for cleaning jewelry and precious metals. Removes general soils, particulates, fingerprints, oils, and oxides that accumulate with normal use. Gemstones and precious metals alike are quickly and safely restored to their original brilliance with this free-rinsing solution. 1 quart (0.95L) makes 3 gallons (10.8L). 1 gallon (3.8L) makes 16 gallons (60.8L). Biodegradable phosphate and caustic-free alkaline cleaner for heavy industrial use. Removes grease, oils, and particulates from automotive, aircraft, and similar mechanical components; oils and lubricants from machined parts and stampings in machine and metalworking shops. It is often used by chemical plants, petrochemical refineries, appliance factories, telecommunications equipment producers, printing plants, and other industrial manufacturing and fabricating facilities. * No effect if solution temperature is less than 60°C (140° F). Solution concentrations may vary. The amount used depends on the particular solution and the type of soil to be removed. Follow the instructions on the solution container. *A hazard fee is required when hazardous goods are transported.